This entry was posted in WordPress Design and tagged Wordpress Theme Developer. It’s been an incredible journey and I have learned more than I could ever have imagined. I hope my story might be something that you can relate to and maybe helpful to others who are thinking of starting out in the freelance world with WordPress. I started out in the usual way, building HTML websites. 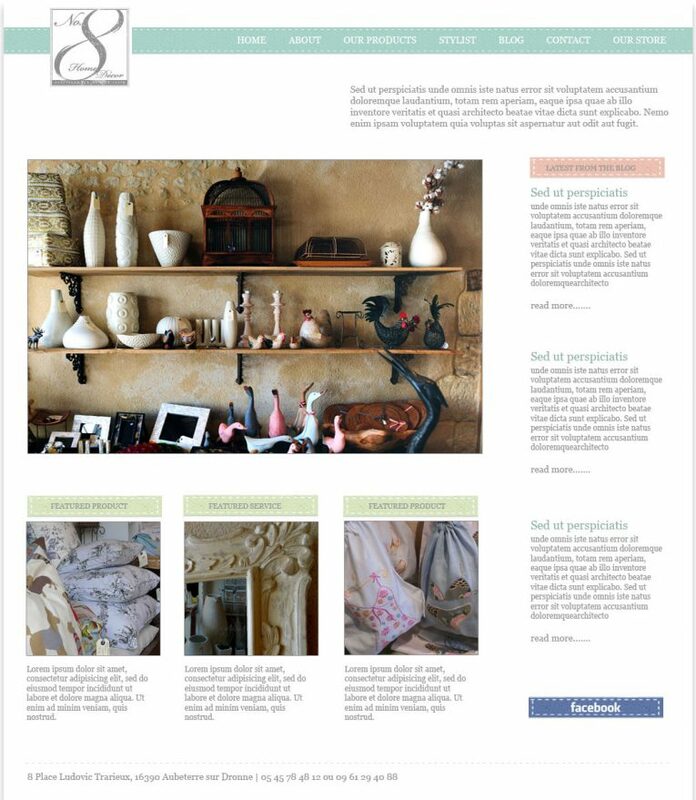 My first ever website was for a holiday rental villa and I built that with good old Microsoft Front Page. Most people have probably never heard of that now as I think it was discontinued in 2003 and replaced with Microsoft Expression web, which was allegedly much more advanced? – umm! I found HTML a fairly straightforward language to learn and was starting to really enjoy coding websites and styling them with CSS (stands for cascading style sheets that determine the layout and aesthetics for web pages – definitely one of my favourite tools to work with in web development). By now I was building websites for myself and my family ranging from one dedicated to my chocolate labrador to a site for a handyman – I discovered I could build a website for almost anything! HTML was great but I very soon discovered that I needed to do more, I wanted to be able to provide more functionality like contact forms and other interactive elements. To do that it seemed that I would either continue on the Microsoft path or venture down a new route with PHP. I am so glad I chose PHP! I bought a book called PHP Solutions by David Powers I went through the book and did all of the exercises and when I got to the end I would stay that I was still pretty confused and a just a little bit overwhelmed. Then I went through it again and it was starting to get a bit clearer, I could build a contact form and I was starting to understand how it all fitted together. I was learning a new language, it was alien and confusing at times but equalling fulfilling and rewarding. I did a few more online PHP tutorials and found I was really starting to like the language, so I took a one week intensive course in London. Off I went down the learning track again and learned the basics of Photoshop, Illustrator and InDesign. I bought the Adobe Classroom in a book series to learn these and it was all pretty straightforward. The learning was hard work and I had to seriously discipline myself but it was so worth it. When I think about the tools I use every day now without a second thought, I forget how far I have come and how hard I worked to learn it all. The time had come to take myself off to college again and learn to be an expert web designer. I went to Cornwall College and did a degree module higher level course. I really loved that and I learned loads about design. We had to design a website, a magazine spread and an advert and I still use the fundamentals of that course each and every day. We used Illustrator, Photoshop and InDesign a lot during the course, so I got proficient. I met some great people on the course and I still work with some of them today. Going back a few paragraphs. 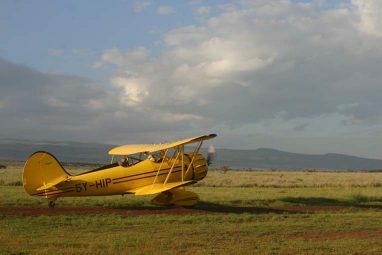 During the PHP learning curve I had started to work with database driven websites and content management systems. Whilst I could now go about building this stuff myself, I had heard about some sophisticated platforms, namely Drupal, Joomla and WordPress. I chose Drupal because from what I was reading it was the best established (WordPress had only been around for a year or so at the time). 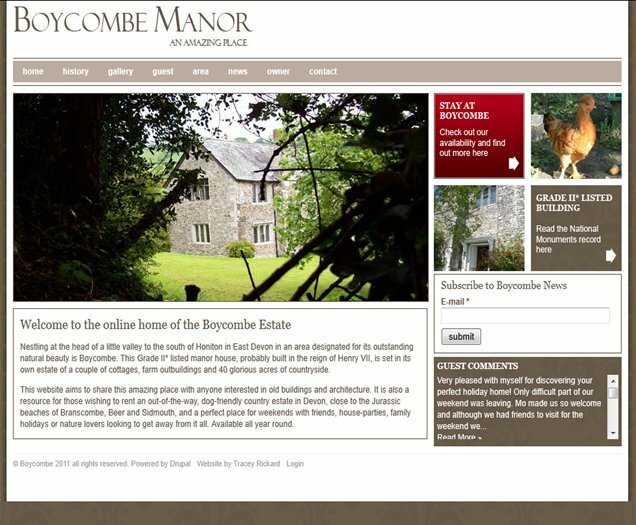 Below is Boycombe Manor, one of the two sites I built with Drupal. It was a good platform to work with from a freelance developer’s point of view, maybe a bit convoluted but you could achieve a lot. But I had hit a wall, I was struggling because my clients were struggling and that was massively disappointing. All of my learning was in vain because at the end of the day I was doing all of this for my clients and they just could not get to grips with the content management interface, they were having difficulty carrying out basic editing tasks. I could very easily have thrown in the towel but quitting was not an option. I had to bite the bullet and go for my second choice, which was WordPress. It seems ridiculous to think now that WordPress could ever have been a second choice but everything was so new then. The second person I have to thank hugely is Thord D Hedengren (@tdh), he wrote a fantastic book called Smashing WordPress beyond the blog. It’s where I learned to build WordPress themes and where I began to really love WordPress. This platform was so much more user-friendly than anything I had come across before. The book is not in print any more but you can still get second-hand versions on Amazon for a price. Here is the WordPress news theme I built when learning from TDH, it was all very exciting. I learned how to adapt all of the various areas of the page, to add widgets and custom hooks to be able to have advertising banners in the header. Of course things change and we learn new things every day but the fundamentals have stayed the same over the years. I bought a few more books and read loads online, watched lots of videos on WordPress TV. One of the best things I did was to take the 2010 WordPress theme and write comments above every single line of code, so I knew exactly what every piece meant and what function it served. It took ages and my PHP training certainly came into its own. Here you can see one of my very first professional web designs on WordPress. 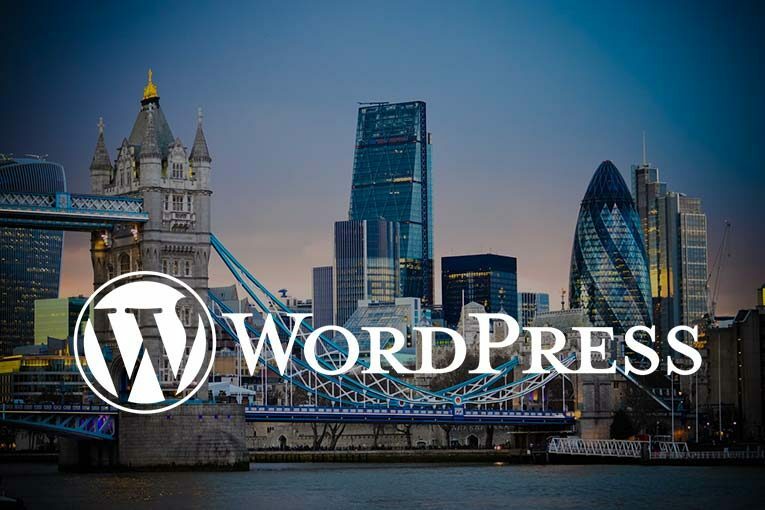 Whilst this was a pleasure for me to build and I still love building with WordPress, the biggest success was in the fact that my client was able to very quickly get to grips with the editing and management of her content. She was enjoying working with WordPress too, so not only was my client happy with her website but also confident in managing it. I could not ask for more. I was now officially a freelance WordPress designer! Whenever I got stuck I was helped. All I had to do was ask my questions online in the WordPress support forum and they were answered. I try to go online regularly and answer questions for others because the forum helped me so much. There is a whole planet of people out there in the WordPress eco-system just waiting to help and involve you. 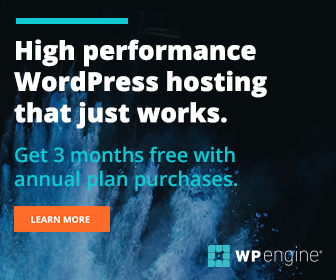 Then you have the meetups, huge events with fantastic presentations from the gurus – if you can’t get to a meetup you can usually watch all of the presentations on WordPress TV. 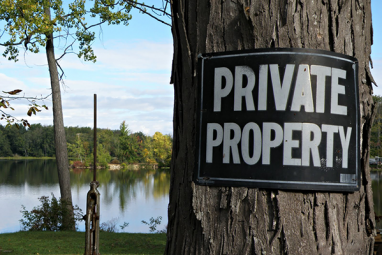 You have to watch it because you can get cabin fever. I have a studio and I work by myself so I make sure I get out and network as much as possible. I have met loads of great people through networking and they have become my work colleagues and friends. I also walk every day. I get myself out with the dogs for at least an hour and it often feels very liberating to be in wide open spaces. 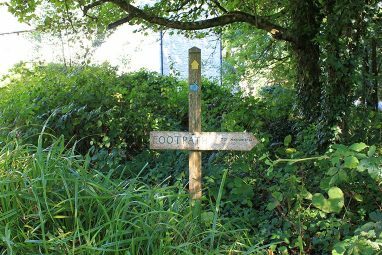 I am lucky there are some great places to walk near here and I have solved more than a few issues with my walk think time. My background was a big help. I was employed by a large blue chip company but I worked from home and hot desked at head office from time to time. That set me in very good stead. Nearly a decade and about a hundred websites further down the line, I still absolutely love being a freelance WordPress designer. I wouldn’t want to work with any other platform. It has been a great journey and the hard studying was definitely worth it. I look forward to continuing to learn as WordPress and the web in general evolve. One definitely needs to keep up that’s for sure!